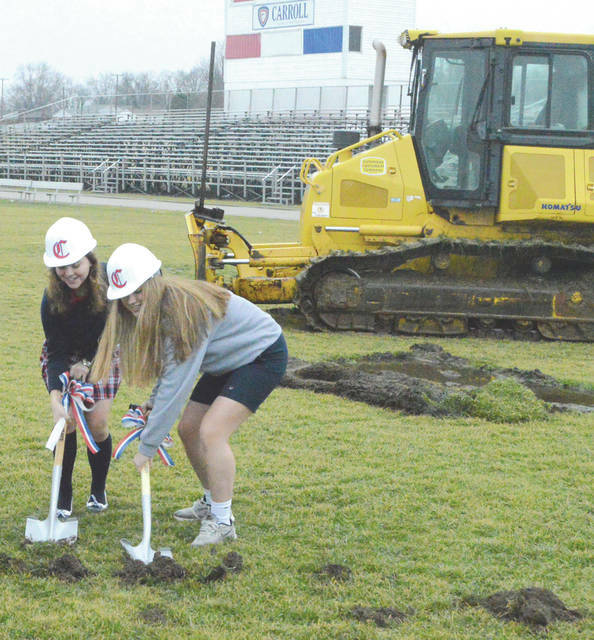 School officials broke ground at 11:01 a.m. Feb. 11 to kick off the creation of a $2.1 million artificial turf athletic field, at Carroll High School in Riverside. 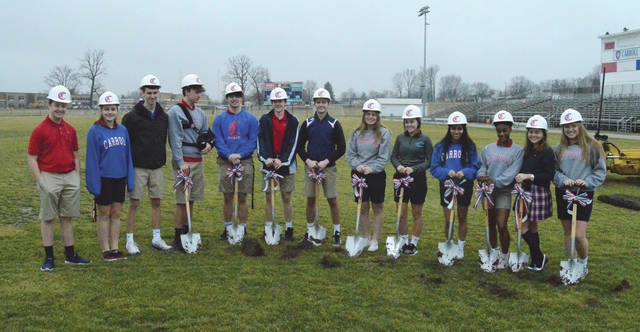 Several Carroll High School students also got to enjoy a ceremonial dig Feb. 12 in celebration of the school’s new stadium field and four-lane track, which are expected to be completed by August, 2019. 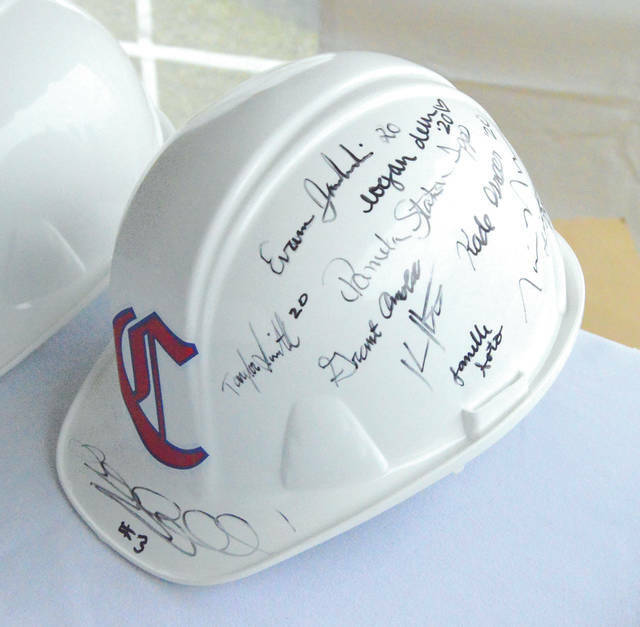 School officials and students signed a Carroll hard hat to commemorate the Feb. 12 groundbreaking ceremony at Carroll High School in Riverside. A pair of Carroll High School students share a laugh during the ceremonial groundbreaking ceremony for a new artificial turf field, Feb. 12, in Riverside. 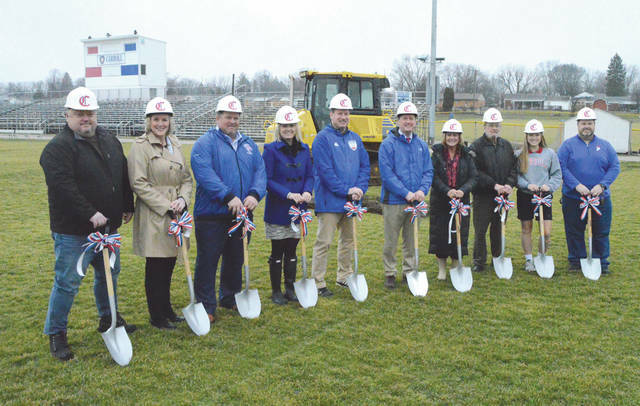 RIVERSIDE — With hard hats, ribbons and spade shovels, an assembled group of alumni, board members, school officials and students broke ground on Carroll High School’s new $2.1 million artificial playing field and four-lane track, at 11:01 a.m. Feb. 12. The project kicks off the public phase of Carroll’s Foundation for the Future renovation campaign, which will include improvements to five of the school’s science labs while building two new ones. According to the school’s publication Reflections, funding for the field, the St. John the Evangelist chapel, and a $250,000 endowment have already been completed. Principal Matt Sableski said the hope is to have the running track and artificial turf completed by the first week of August. According to the school, installation of the new field and running track will be the first major upgrades to Patriot Stadium since 1983 when the current press box was built. New stadium lights were installed in 2018. The lighting improvements were the initial investment in what is Phase Two of the Foundation for the Future program. The estimated price for the turf, track, lights, science labs, endowment and Carroll Patriot funds combined is $4.5 million. “There are many phases of this campaign, this is only one of them, but this is certainly the one we’re most excited about today,” Sableski said. Athletic Director Scott Molfenter was understandably excited about the new athletic facilities. “This’ll be my 28th year at Carroll, and I’m very very excited to begin here,” he said. “It creates an environment where our kids can always participate. We don’t have to take time off for weather or worry about a rainy Friday night, or a messy week. Sableski said anyone wishing to make a donation to the Foundation for the Future program can go to the organization’s website at www.carrollhs.org for more information.